Tomorrow marks the start of the Chinese New Year and the beginning of the Year of the Sheep, according to the Chinese zodiac—or the goat, depending on how you translate Mandarin. For all you sheep people (sheeple?) who are old enough to drink (that’s those born in 1931, ’43, ’55, 67, 79 and ’91), here are some cocktails to play to your strengths and good luck charms. Even if you aren’t a Caprinae sign, we like to think that bowing to the sheep-goat may bring you good luck. Plus, these are all delicious. One of your lucky colors is green. This gin drink gets its bright color from muddled kiwi. Your other lucky color is red. This strawberry-and-tequila combo also features a brilliant black pepper syrup, making it sweet and spicy. You enjoy taking care of other people, and there’s no better way to do that than with a big bowl of punch. Try this one from New York City's famous Death & Co.
Sheep have a reputation for thrift. So you probably want to make the most out of inexpensive ingredients. If you have some cheap beer lying around, transform it into a Michelada. You’ll give new life to what could otherwise just be crap in a can. Finally, sheep have a deep appreciation for beauty. 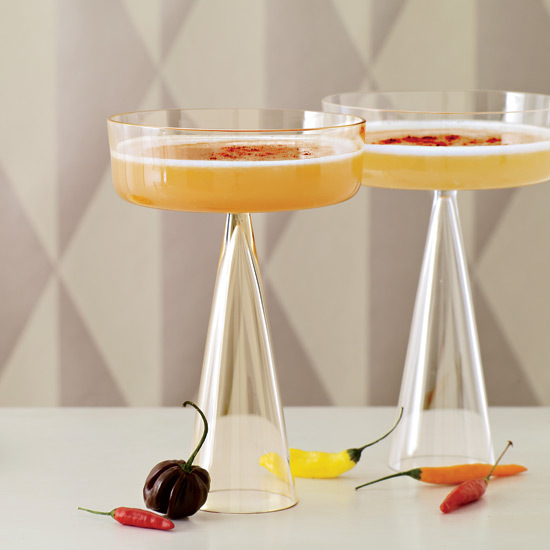 With just three ingredients to shake, The Stepping Razor Blade is easy to execute, but the dusting of cayenne on top makes it quite a handsome drink.